Sunday, October 14, 1-5 p.m.
Everyone is invited to attend this FREE event! Music and Dancing by Church Members & Friends! Everything on sale on Sunday! 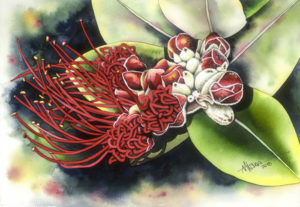 Kahu’s latest watercolor of the beautiful lehua blossom (in the photo above)! The funds raised will help pay for costs of some much needed projects at the parsonage. Please invite your friends who love music and art!